These handmade toys are inspired by Jeju’s equestrian heritage and they come in all sizes from keyring to huggable. We all know how delicious they are but will they stay fresh for your flight back? No need to worry with these Hallabong-shaped candles, perfect for the sitting room. Don’t leave all your memories on the street, trap them in these bottles forever. Fill it up with your own trash, or trash you find on the street, and do your bit to leave Jeju cleaner. Mongni is a popular animated haenyeo character. Cuddly toys are among the most popular Mongni merchandise. “Mwohamen?” or What’s up? can be found on badge souvenirs (and much else) to celebrate the color of the local vernacular. 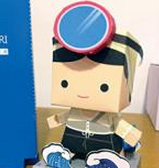 Named after the sound a haenyeo, or diving woman, makes as she exhales after a dive, these cardboard figures are fun to make and uniquely Jeju.